Look at that clown, just mad doggin’ the Pres. Giants win the World Series and get to visit the White House. Oh joy. 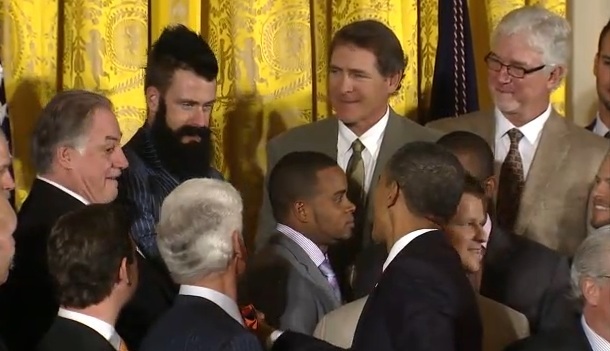 Brian Wilson gets to meet President Obama. There’s your proof. You can’t tell me for one second that the Secret Service didn’t plan it perfectly to have people placed in between this nutjob and the president. In fact, they probably had secret snipers inside the walls just waiting for the Beard to make his move on Obama. Boom, sniped. This entry was posted in Baseball, Events, NBA and tagged Brian Wilson, brian wilson and obama, brian wilson and president obama, Brian Wilson's Beard, Giants, President Obama, SF Giants, white house, World Series. Bookmark the permalink.